Despite being suspended for the remainder of the season and all of the 2014 Major League Baseball (MLB) season, Alex Rodriguez returned to the New York Yankees Monday night amid a crowd of media members, fans, and teammates with differing opinions. A-Rod singled in his first at bat, going 1-4 in his first game since the 2012 playoffs, an 8-1 loss to the Chicago White Sox. Technically, A-Rod has until Thursday to accept his punishment, or to appeal his suspension, which he most certainly will do. Once that occurs, he will have the case reviewed by an independent arbitrator. Since the 211-game suspension is the largest ever given to a player for non-gambling, it will be doubtful that the entire penalty is upheld, but only time will tell. MLB suspended A-Rod “based on his use and possession of numerous forms of prohibited performance-enhancing substances, including testosterone and human growth hormone, over the course of multiple years,” and “by engaging in a course of conduct intended to obstruct and frustrate the Office of the Commissioner’s investigation” MLB said in a statement released Monday. The embattled former three-time Most Valuable Player made a case for sympathy when he spoke to the media before the game. “”I am disappointed with the penalty and intend to appeal and fight through the process,” Rodriguez said, while avoiding direct questions as to whether he used performance-enhancing drugs (PEDs). This ‘nightmare’ will now follow the New York Yankees for every game, with none bigger than the first appearance of Alex Rodriguez in pinstripes, which will take place on Friday, when they host the Detroit Tigers at Yankee Stadium. Rodriguez, in a plea for sympathy that he is receiving from some, said “I’m fighting for my life.” I doubt those sympathetic will outnumber those who dislike him, and expect boos to rain down on the slugger Friday evening. Truth be told, the penalties that MLB have in place for use of PEDs are not nearly tough enough to discourage it. A-Rod is the perfect example. He has made hundreds of millions of dollars playing baseball, and, even though he has been suspended, the appeals process in the collective bargaining agreement allows him to continue to play while earning his lofty paychecks. Only the immediate voiding of a player’s contract will discourage the use of PEDs. 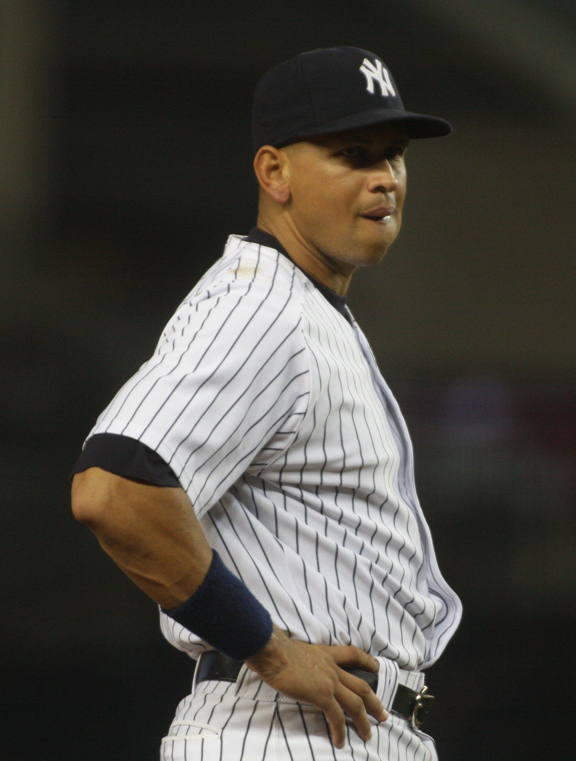 A-Rod is fighting for $31 million of the over $100 million still owed to him on a 10-year deal. As is often the case, it is about the money, and boosting one’s numbers illegally leads to larger contracts, and only the loss of that money can stop it. Yes, boosting numbers can increase pay. But let’s test everyone’s Pinochio skills. Please Include owners, MLB league officers & Commisioner, TV Networks and news paper outlets. 1) In the last decade when Jose Conseco exposed all of this Rubbish. He was called a “liar” and worse. 2) The big baseball labor strike. Billion$ were lost across the board. Ex. $10 cups of beer, $25 parking, TV ad fees, etc. 3) The people who set Pete Rose’s fate, And he will never be officially allowed in baseball. Needed a scheme to bring the fans back. Homeruns! You can’t make this stuff up. Players previously hitting 10 hr’s in prior years are knocking 30, 40 and 50. League officials and owners are smiling with their Stevie Wonder blinders on. Paying the players big. But themselves much bigger! 4) YES networks, cable deals approaching billions around the league. Sneaker and soda sponsorships. Commissioner and owners. By the way, commisioner owns the Brewers. 5) Going way back, When Steinbrenner was at his peak. He had private investigators monitoring Reggie Jackson. He knew when Reggie came out of Elaine’s club, bars, Which “Blonde” was going to his bed. And for you Old heads. Don’t get amnesia! He hired a junkie, gambler “Howie’ to spy and investigate Dave Winfield. So blatantly. He went to trial. 6) SO don’t be naive and think the owners and league didn’t allow Arod and others to to use PED s or Steroids. Oh to close out. Those who are asking Arod to give back his salary. Wake up. Bloomberg gave the multi-billion dollar NY Yankee corp. a 99 YEAR Tax Abatement for the new stadium. Remember, NYC bills don’t go away and still have to be paid. Guess who? You who work in NYC will fill the gap with increased taxes that a multi billion dollar corp getting WELFARE doesn’t have to. Cheers. Are we testing owners, league officers, commissioners, TV networks, and newspaper outlets for PEDs, because this is what we are talking about here. Not sure what Jose Canseco has to do with this. It is possible for the Pete Rose decision to be overturned at any moment. Anyone that owns anything is going to pay themselves more, that is the nature of ownership. The time for players to be ‘allowed’ to use PEDs is over. Things change with time. A-Rod didn’t stop. Again, don’t know what this has to do with the article. Correction, that wasn’t Mayor Bloomberg, it was the Mayor before him.